Dr. Ann C. McKee, the lead author of the study and the director of BU’s CTE Center and chief of neuropathology at the Boston VA, analyzed brain tissue in May at the VA-BU-CLF Brain Bank in Jamaica Plain. Boston researchers who studied the brains of 202 deceased football players published the most detailed portrait to date Tuesday of the devastation wrought by a degenerative brain disease linked to repeated blows to the head, a grim tally they hope removes any final doubts of the severity and long-lasting damage it causes. In Tuesday’s Journal of the American Medical Association, a team from the Boston University School of Medicine and the VA Boston Healthcare System documented the troubling behavior, disturbed moods, and impaired thinking in people who had chronic traumatic encephalopathy, or CTE. 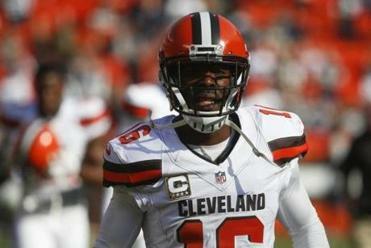 Among the 111 National Football League players whose brains were donated for the study, all but one was found to have the disease. But the difficulties were found even in some high school players. College, semi-professional, and professional players had the most severe cases, however. Even those with mild CTE had suffered from disabling mental problems, including agitation, impulsivity, explosive tempers, and memory loss. More than half contemplated suicide. Suicide, in fact, was the leading cause of death among those with mild CTE. His announcement came on the heels of the latest CTE study. The study presents the largest number of CTE cases ever published, said the study’s lead author, Dr. Ann C. McKee, director of BU’s CTE Center and chief of neuropathology at the Boston VA.
“It’s impossible to ignore this anymore,” McKee said. 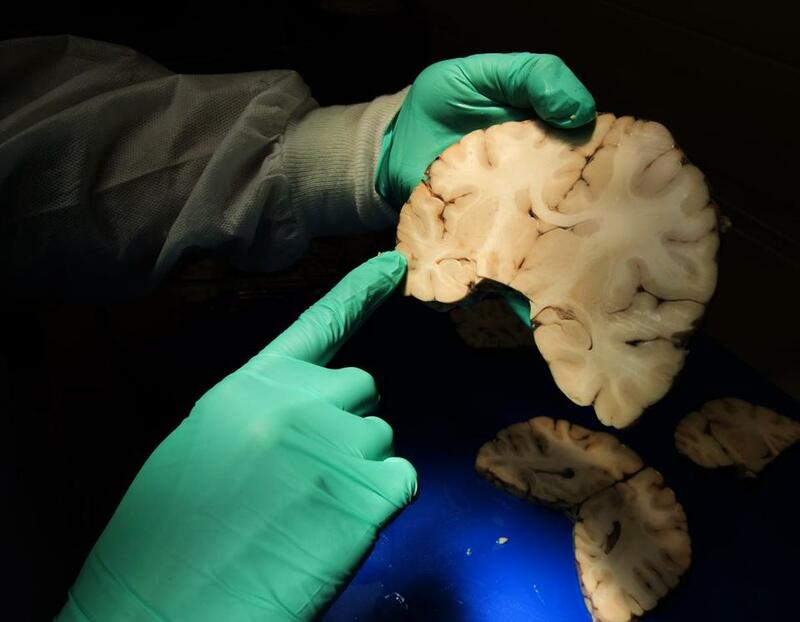 Dr. David L. Brody, neurology professor at the Washington University School of Medicine in St. Louis, said the new study deepens and solidifies researchers’ understanding of CTE. Similar findings have been observed previously, “but never on this scale, and never so systematically,” said Brody, who was not involved with this study but has collaborated with McKee on other research. CTE is believed to occur when multiple hits to the head, including those that don’t cause a concussion or produce symptoms, trigger a degenerative process in the brain that years or decades later can cause disabling symptoms. CTE has been diagnosed in former amateur and professional athletes as well as military veterans, but it is not known how common it is or why some are afflicted and not others. A big research challenge is that CTE can be diagnosed only by examining brain tissue after death. For the study published Tuesday, the researchers sought to connect the condition of football players’ brains with their experiences during life. They thoroughly examined multiple sections from each of the 202 donated brains, interviewed the survivors of the patients at length, and reviewed medical records. The vast majority of donated brains — 177 in all — bore the telltale clusters of a protein called tau, the sign of CTE. And every participant whose brain showed CTE had experienced symptoms while alive. “One of the large mysteries of this disease is why are people so affected even in the early stages,” McKee said. The participants played football for an average of 15 years. More than 90 percent of college players in the study sample had CTE. It was expected that a large number in the study would have the disease, because relatives donated the brains out of concern about their late family member’s symptoms, McKee said. This data cannot be used to estimate the prevalence of CTE, which remains unknown, the researchers noted. Still, McKee, who has been studying CTE for years, said she and her team were “startled” by the exceedingly high prevalence of CTE among their samples. David A. Hovda, director of the UCLA Brain Injury Research Center, called the Boston report an “excellent study” but noted some limitations. He questioned whether researchers looking at pieces of the brain can truly tell whether the disease is mild or severe. Additionally, Hovda said, new rules and better protective equipment have been put in place in recent years, so the study may be measuring years-old effects that may not occur now. The study broke down subjects by the football position. They ranged from 44 former linemen, who sustain hits on nearly every play, and one punter and one place kicker, who rarely get hit. The report did not name specific players, but those who have been publicly identified as having the disease include Mike Webster, Ken Stabler, Bubba Smith, Dave Duerson, and former Patriots Mosi Tatupu, Junior Seau, and Kevin Turner. It did not include players in other contact sports, such as ice hockey. Asked for comment, the National Football League released a statement praising the researchers’ work and stressing its own commitment to research. In 2016, the NFL pledged another $100 million to support research into brain trauma and its prevention. A spokesman for the New England Patriots declined to comment on the study. 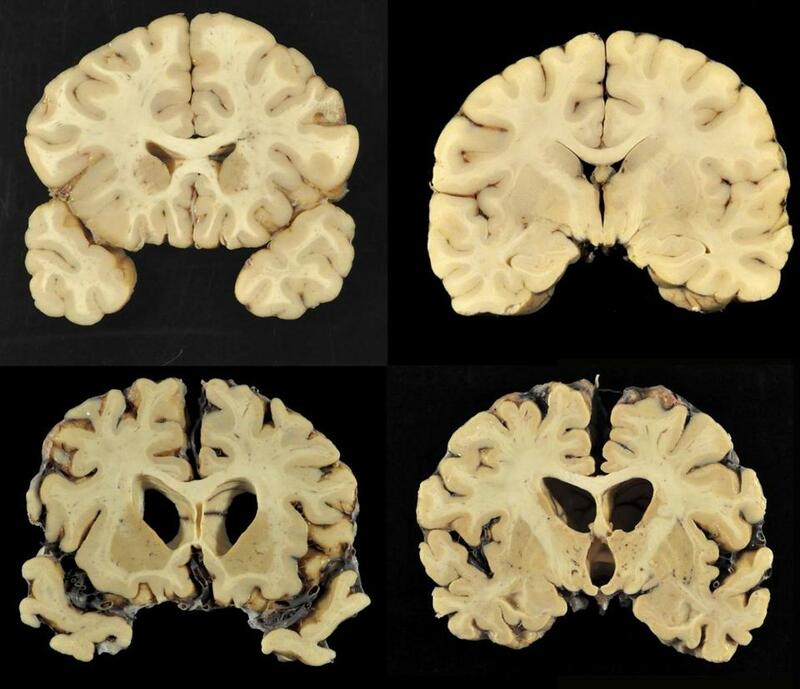 A combination of photos provided by Boston University shows sections from a normal brain (top) and from the brain of former University of Texas football player Greg Ploetz (bottom), in stage IV of chronic traumatic encephalopathy.